Accurate vocal harmonies every time, even with complicated songs, because the Live 2 tracks your guitar chords, not your voice. A surprising number of songs trick other harmonizers because these songs just don’t work with a single key/scale setting. In fact, any song that has the same note sung over two different chords (for example, a C sung in the melody over a C maj / F maj chord sequence) is going to confound conventional harmonizers. 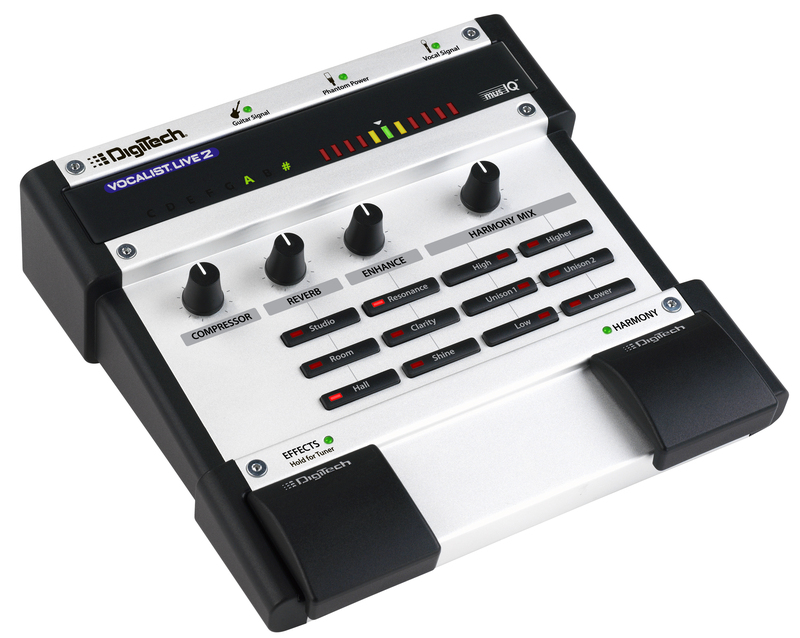 The Live 2 uses breakthrough musIQ® technology to directly analyze the output of any electric or pre-amplified acoustic guitar (no special MIDI guitars or hex-outputs needed). Then it generates the correct vocal harmony. For example, if you’re singing an A over the chords that are generally found in the key of G, Vocalist will harmonize with a C. But, if you then play an A major, Vocalist will shift to the C#...because like any good harmony singer, it listens to the guitar! With musIQ, forget about the technology – just sing and play! 3. Sing and play — when you want harmony, just step on the footswitch! musIQ is a revolutionary technology that eliminates the need program a song’s key or changes to create accurate harmonies. musIQ analyzes your lead vocals as well as the chords and notes played on a guitar in real-time to automatically generate perfect vocal harmonies. Simply plug into the Live2, play your guitar and sing. 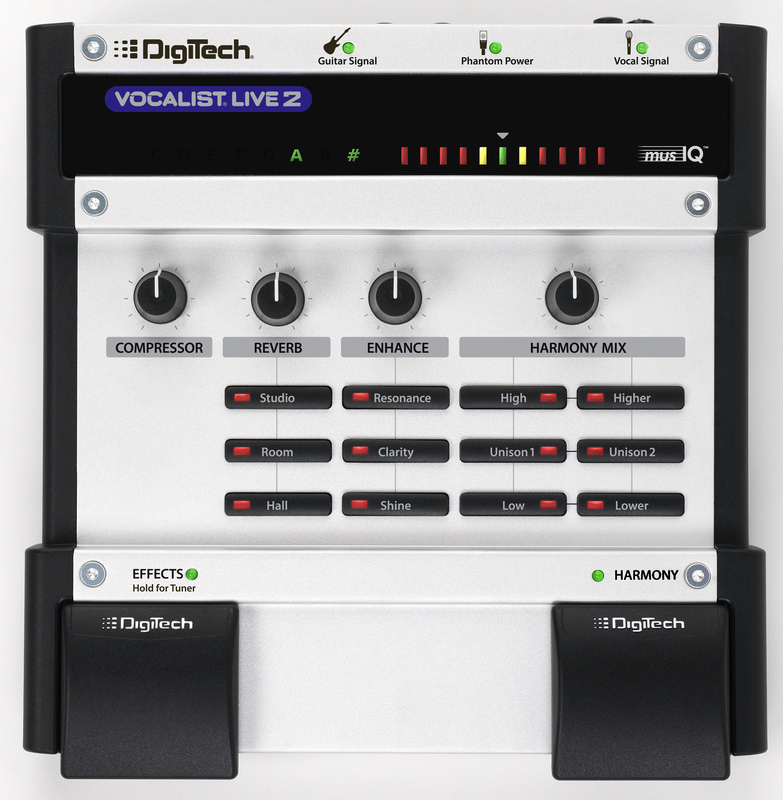 The musIQ technology will ensure your vocal harmonies are always right on. Can the Live 2 and Live 4 be used with instruments other than guitar? The Live2/4 are designed and programmed to work with a guitar. A keyboard will not generate consistent harmonies. The Live 4 features an operating mode that requires no instrument be connected. You simply enter the key, and Major or Minor. Other customers have reported success using other instruments but Vocalist cannot guarantee the accuracy of the harmonies with any instrument input other than a guitar on these models or by manually setting a song key and scale on the Live 4.